This article is a follow-up from Heavy Weather Dynamics: Yachts in Following Seas published some months ago. It has since become one the most read items on this site. While the original article applied to most sea-going monohulls, the following discusses more specifically fast modern hulls, or yachts in very fast following seas, such as can be found in the Southern Ocean. 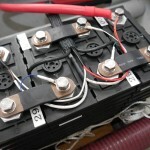 A lot of it is also applicable to fast power boats in exposed heavy weather areas. Earlier in the year, I was up for a change of scenery after more than a decade in southern New Zealand and so I loaded up the sloop Nordkyn for a 1000-mile trip northwards along the near entire length of the country. Sailing up and down the New Zealand coast can require a bit of effort due to the extremely changing nature of the weather and it is a windy country. As often when relocating, we tend to carry extra items that we don’t quite feel like abandoning behind, and this was no exception. On top of the standard ocean cruising gear, food and stores, a lot of tools, paints, materials, books and other items made it on board. This extra gear was stowed into lockers forward of the mast, some more found its way into some boxes left on the floor, and some more items went aft, eventually achieving a perfectly level trim. All up, the sloop may have gone down some 50mm, so say a good 1500kg above full cruising displacement. Nordkyn heavily loaded just before leaving the South. The white boot top is 100mm high; there is normally about the same amount of antifouling showing below. After a few pleasant days in the little port of Oamaru, a southwest gale on the forecast appeared as a perfectly valid opportunity for making some good distance to the north. Counting on an average speed above 10 knots, 35-40 knots of true wind would be reduced to a more relaxing 25-30 knots apparent, one of the big perks of fast ocean cruising boats. Not only distances covered in a day can be quite phenomenal, but on the run the wind is not as strong for manoeuvring on board and one can sometimes literally sail away from unpleasant conditions in a matter of hours. Leaving port late in the morning, the first milestone was Banks Peninsula some 120 miles away and we were going to reach it the same evening. With a single reef in the main and a #2 jib forward, the big sloop was fully powered up and light at the helm. As we gained more and more of an offing from the shore, the sea built up to its normal proportions for the wind blowing parallel to the coastline; around 4 metres at times and somewhat confused with the occasional snarly wave and patch of white foam. I decided to take the helm over from the steering vane and get a first-hand feel for the conditions. The first difference I noticed was that the bow often didn’t alight as per usual, not that we seemed to sail any slower. Instead, we were sailing in a different, unusual mode. 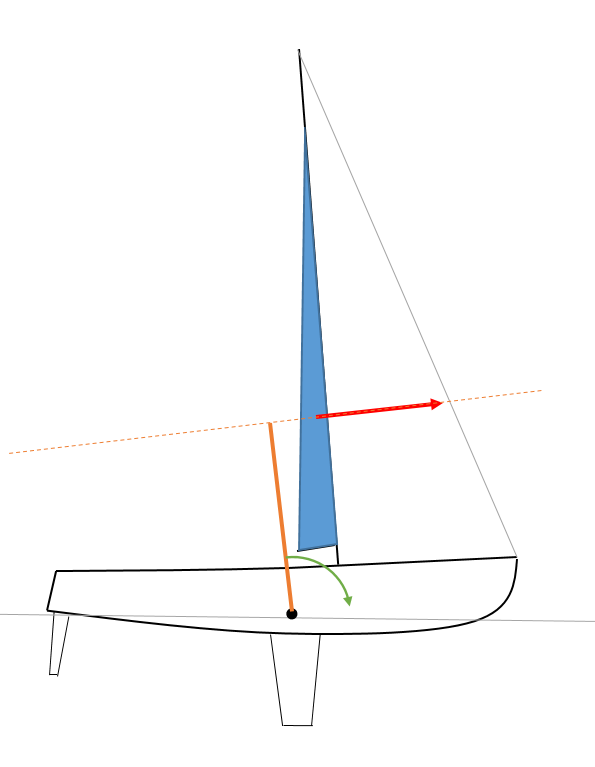 In normal sailing trim, the nose lifts and the hull parts the water almost at the mast at times; it transitions into planing mode. Instead, here I observed the sloop clipping along at over 14 knots for long periods trimmed dead flat, still cutting the water at the bow. The apparent wind dropped down another notch, and sailing so fast with so little wind was rather puzzling at times. Peak speeds touched 18 knots. We were faster than the surrounding sea, catching up, climbing and crossing over the waves, something I frown upon in bad weather and consider as asking for trouble. Offshore I would have reefed the main further, brought the speed down to just keep up with the sea and gone down-below to read a book or have a rest. However, this was just a moderate coastal gale, the sea wasn’t very high and I was happy outside hand-steering for a while. Watching the flat wake behind and picking a pathway in the sea at the tiller was exhilarating. It was spectacular sailing. Sensing and balancing the huge forces at play, the feeling was one of awe and huge respect. It was like holding a tiger by the tail. Alone on board, as I was watching the silvery grey waves form, develop and disappear with no land in sight, I was transported thousands of miles offshore again. Too fast doesn’t mean much in terms of absolute speed. Some old hulls were often becoming completely unmanageable near their hull speed, often a mere 7 or 8 knots, and people used to say this was “going too fast”, even stopping completely at times. The issue wasn’t speed, but hull hydrodynamics. Too fast, for us here, is as fast as a fast sea or faster than the sea on boats that are manageable in these conditions. Typically, there are two pathways for achieving this. If the sea is high and breaking, one can ride up the back of a wave, catch up with the crest in front and cross it as it is about to collapse: at this point the hull falls off the edge as there is no water to support it behind the crest, because the upper part of the front face of a wave about to break is near-vertical. The consequences of “jumping off the cliff” are almost always disastrous. Fast power boats that can exceed some 20 knots also face this risk. I only heard directly of one such instance once from a sailmaker who was racing downwind in a gale in Cook Strait, New Zealand, very tidal and exposed. They planted the boat, a Farr 1020, into the sea after crossing a crest that had “nothing behind it”. What immediately followed was so violent that they were instantly dismasted. A hard-driven fast sailing yacht can fall off the edge of a steep wave. Average cruising yachts don’t have a chance of getting there no matter what, but high-performance hulls driven quite hard do. The other way is far more common and arises from “hitting a bump”. The sea in a gale is often anything but well-formed and regular; there are secondary waves in the main troughs, often coming from a different angle. A fast yacht coming tearing down the hill can engage into such a secondary lump while the hull is pitched bow-down. If the lump is higher than the freeboard forward in particular, there can be potential for unpleasant developments. The bow may bury and trigger a nose-dive or a high-speed broach. The outcome ranges from a fright to damage or injuries; if unlucky enough, one can also get subsequently rolled by the following crest as it sweeps past. 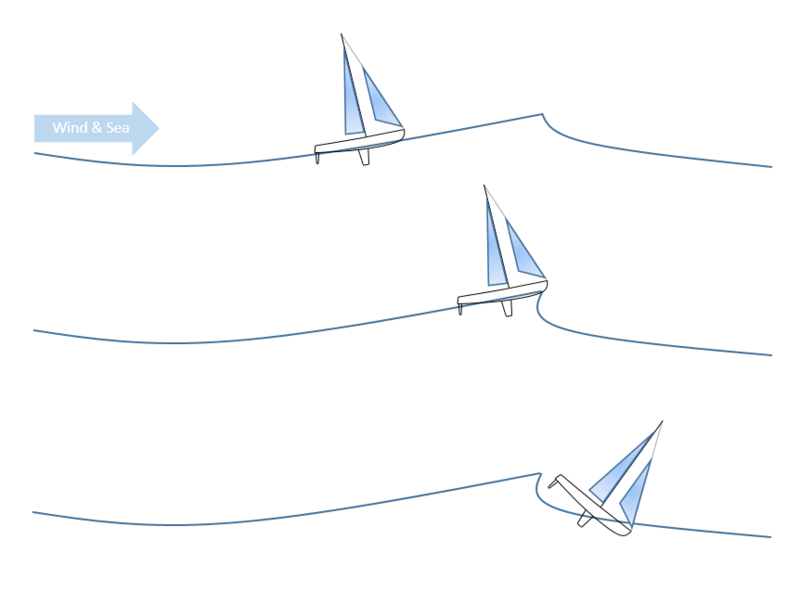 A yacht running fast in a heavy following sea can engage into a secondary wave in a trough. When I designed the Nordkyn hull, I deliberately built more volume into the upper forward sections than what is usually found on modern yachts today to account for the downwind speed potential and inertia. On that day off the South Island, the stage was set. The Yarra had never really been fast enough to enter this territory, being held back by its pinched stern sections, but with its slippery hull and superb course stability, Nordkyn just wanted speed and the sea wasn’t high enough to get into serious trouble with a boat that size. In fact we had already hit a couple of modest lumps without much in the way of result. Again, the sloop accelerates smoothly above 14 knots, catching up with the crests and riding down into the troughs. I overtake a few waves, looking for a decent bump down in a trough, find a good one and steer into it. The bow hits it squarely in a spectacular fashion before we have quite reached the bottom of the through; a shiny wall of solid green water parts away on each side. The thought that there is no way back now crosses my mind as the scene appears to unfold in slow-motion. From the cockpit, I am peering forward and I can see the water almost reaching the cathead, but the deck remains clear. At the helm, it feels as if the boat just plowed into something very soft, but massive. I can sense the deceleration, the stern lifting and the helm becomes very light and less responsive… I correct with a lot of rudder to counter a broach as the bow pops up, the sails are still filled solidly and the hull powers through and over the mass of water. I didn’t like the feeling at all and the experiment is not repeated. The volume in the hull forward provided considerable margin and the deep rudder blade was an asset, but there is clearly a limit in this direction. Going too fast only matters for boats that are capable of getting there in the first place. Ocean-cruising sleds like Nordkyn are different from average cruising boats: new options and possibilities are suddenly open, but with those come new limitations and risks sometimes. Those need to be understood. Having designed the hull, I wanted to witness what was going to happen at the relatively small scale of a common gale if I simply forced the issue. Had I thought for an instant that it might go very wrong, I wouldn’t have done it. Had it gone wrong anyway, the boat is built like a submarine, the rig is phenomenally strong, there wouldn’t have been anything to break or carry away and no one else to lose overboard. One normally learns about the capabilities and limits of a design over time and when circumstances challenge those limits. This often takes years even sailing offshore and in the high latitudes. It is usually just as well this way. I would have never pictured the Yarra sailing up into a huge breaking sea, disappearing under the collapsing wave crests and repeatedly coming out unscathed on the other side, but once it did. This is how I discovered it could be done. Afterwards I tried to avoid finding myself there again, but having seen it was a huge confidence factor for crossing bad stretches of ocean with a fairly small boat to visit very remote places. The above wouldn’t have been easily achievable under normal loading conditions, because the bow rides up at speed. It may also have ridden up on that day if I hadn’t been carrying as much canvas: carrying a lot of mainsail downwind in particular tends to push the bow down. The mainsail being a triangle, its centre is one third of the way up. The distance between the dotted line and the centre of gravity is the pitching lever the driving force is acting through. Running under a single headsail doesn’t lift the bow as often claimed because the driving force is not acting on a line below the centre of gravity, but it is less detrimental, mainly because the part of the sail actually working tends to be lower. At best, the jib force may act perpendicularly to the forestay. The upwards angle and the low position of the sail help reducing the pitching lever pushing the bow down. Running on a headsail alone also offers more stable tracking, but dropping the mainsail is a double-edged sword: it can be quite challenging to get it back up downwind later if needed and if the wind is still strong. In any case, the boat should be set up to allow it, even if it means winching it up. Trim is an important aspect when running before the sea at high speed in the sense that it influences freeboard forward and can reduce the volume of water displaced by the bow sections when entering a wave. A bow-up trim contributes to staying on top basically. 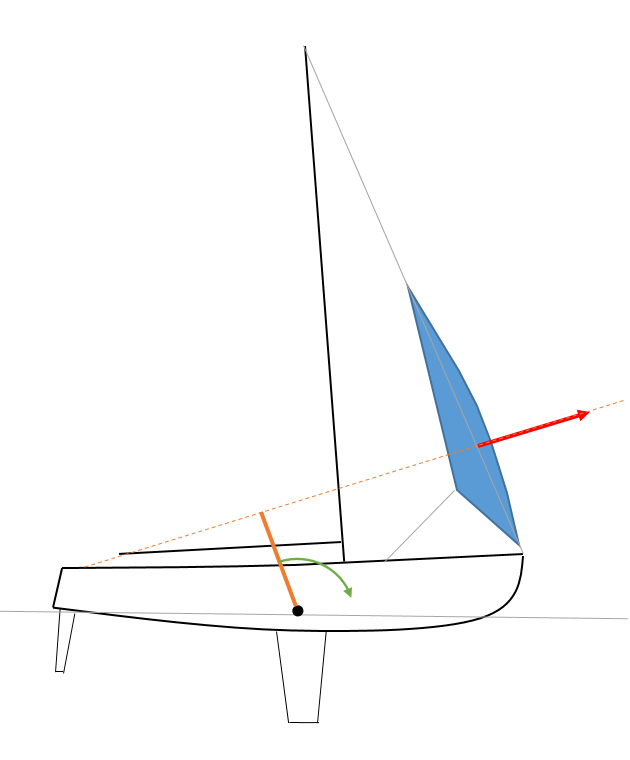 As sails contribute to a bow-down moment, modern offshore racing yachts usually include a stern water ballast tank to offset it and allow carrying more canvas for longer on the run. On a cruising yacht, it is irrelevant. Nordkyn will sail steadily and effortlessly at over 10 knots and it would be foolish to design for more speed than this in bad weather when one can already cover 250 nautical miles or more in a day – if the wind holds throughout. The other important aspect relates to inertial forces. When a yacht on the run engages the bow into a wave, a buoyancy force is produced forward. This force contributes to lifting the bow and – given enough time – it will always succeed. Under some circumstances, this time may not be available and this is where the concept of rotational inertia comes into play. A force acting on a heavy object is slower at producing results than if the object is light: try applying the same force pushing a car or a shopping trolley. The same principle applies to rotational motions, but there the distribution of the mass also matters. This can be readily illustrated by attaching two weights at the extremities of a bar and trying to rotate it, and then moving the weights together to the middle and rotating it again. Rotation is a lot easier when the mass is concentrated. A vessel with a 12-metre waterline will have its centre of gravity just slightly aft of the half-waterline, so about 6 metres back from the bow. Now let’s say that the ground tackle forward weighs 250kg. Its contribution to pitching inertia is Iyy = 240 x 62 = 8640 kg m2. The separation distance makes a huge difference: 300 litres of water near midships, at half-a-metre away from the centre of gravity will contribute Iyy = 300 x 0.52 = 75 kg m2 only! For the same reason, the rig is also a large contributor to pitching inertia and bulb keels are worse than straight fins. It is a matter of balancing benefits and drawbacks. Bulb keels work best with hull shapes that strongly damp pitching motions. Mass elements away from the centre of gravity of a yacht are the largest contributors to pitching inertia. 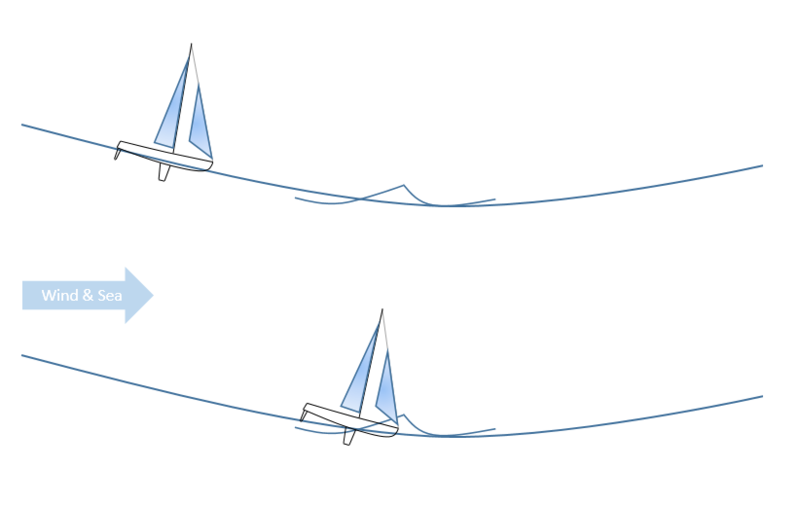 A vessel with high pitching inertia reacts much more slowly to trimming forces, like a sudden buoyancy force acting forward when engaging the bow into a sea. Boat speed aggravates the situation because it requires quicker changes in trim to keep the bow up. Unfortunately, one doesn’t always choose how fast a boat sails in following seas and high pitching inertia adds an uncontrollable risk into the equation: planting the boat into the sea. Before even leaving the South Atlantic during his Golden Globe 1968 southern circumnavigation, Bernard Moitessier  insists on alighting his boat and concentrating weights amidships to make it safer for running in heavy weather. He goes as far as throwing provisions and valuable gear overboard to achieve this, without providing much in the way of explanation. Moitessier was an instinctive sailor and acute observer and it is clear that he could sense the difference reduced hull resistance and inertia made to sea-keeping in heavy weather, even with his long-keeled steel boat and solid wooden masts. In the technical appendices of his previous book  recounting his passage from Tahiti to Alicante via Cape Horn, he also briefly discusses engaging into secondary waves in the troughs. Since his ketch Joshua was only keeping up with the sea, his answer was not slowing down, but rather taking them at an angle. Fast modern yachts can and often should readily go down to a very small rig in high winds and heavy following seas. They still easily keep ahead of breaking crests. In extreme conditions, even a bare pole can provide enough drive downwind, but personally I prefer keeping some sail up if I can for manoeuvrability. A yacht under bare pole immediately loses all drive if it ever strays from its downwind course. Recovery can be slow and during this time, one is at the mercy of a beam hit. When running under very small canvas, especially a single small headsail, I watch like a hawk for any sudden drop in wind speed. Following the passing of a front, there can be a considerable sea running and I want to maintain sufficient drive to keep ahead even when the wind starts abating. This is often when the mainsail needs to go back up and rounding up to hoist is not an option. Too slow, especially with hulls that offer more resistance, can lead to planting the boat into the sea by suddenly getting launched forward by a steep crest; the most famous example was probably Tzu-Hang , because it was well documented. On the other hand, accelerating to keep up with the sea often means reaching unusually high speeds and negotiating “obstacles” can become a challenge, especially if the bow won’t lift. Sailing faster than the sea with a high-performance design and crossing the crests downwind quickly becomes a gamble if the sea is high, because there is no indication of what the hidden wave face may look like; occasionally, it will be a vertical drop. I wonder did the equivalent weight of both All Black props squeezed into the pulpit, prompt you to consider shifting the ground tackle locker back a bit? The idea of a significant reduction in that contribution to the pitching inertia sounds pretty attractive – but then you would have to faff around with spurling pipes and chain under sails, not to mention figuring out where to put the sail hatch etc. Or did you surmise(correctly as it turned out) that Nordkyn’s full forward sections would provide sufficient buoyancy and you could put the tackle where it belongs? I found from direct experience that, on ocean cruising yachts, you are nearly always looking for weight forward. This is because the centre of gravity must be maintained at 53-54% of the waterline length and there is a lot more hull volume aft of this than forward. It is even more so the case in current designs and gear on board tends to go where there is space for it. The first time I loaded the 9-metre sloop Yarra with everything I was going to take with me, the result was a trim down by the stern and I had to reshuffle all the heavy items forward to correct this. In the case of Nordkyn, I designed a neutral trim in light and loaded conditions and the ground tackle is of course included in light trim. I carry 80 metres of 13mm chain and a couple of anchors. I keep 50 metres of chain and a 45lbs hook in the chain locker forward and the balance is down below in the sail locker a bit further back. The question of inertia is interesting, because sometimes increasing it changes the pitching period of the boat away from the most common wave encounter frequencies and it can improve seakeeping and performance. Modern hulls, with wide flat runs aft, tend not to pitch because the stern can’t go down and it makes them less sensitive to weight distribution. I wasn’t particularly concerned about the weight of the ground tackle forward on Nordkyn. The hull is fine forward, but I has more flare and volume above the waterline than many designs. The driver for this was the risk of hitting a “bump” at high speed and while reduced mass forward helps, we are talking about less than 250kg of steel in the chain locker on one side and a couple of cubic metres of buoyancy in the forward sections on the other… the stem freeboard is 1400mm. Overall, the boat is incredibly dry, I can usually change a headsail upwind without getting wet, so it worked out well. It would be possible to shift things around and move the chain back and then I would also slightly offset the keel bulb forward to compensate. Not having the chain crossing half of the foredeck solves issues with the sail locker hatch as you point out and this is quite important because all the headsails go through there. Will you explain why the CG should be 53-54% of the waterline length – and are you talking about the DWL and not the actual (heeled) running length that you say should be used for D/L calculations? Elsewhere you talk about the need for a separation between the CB and the (geometric?) centre of the waterplane. Why is this? 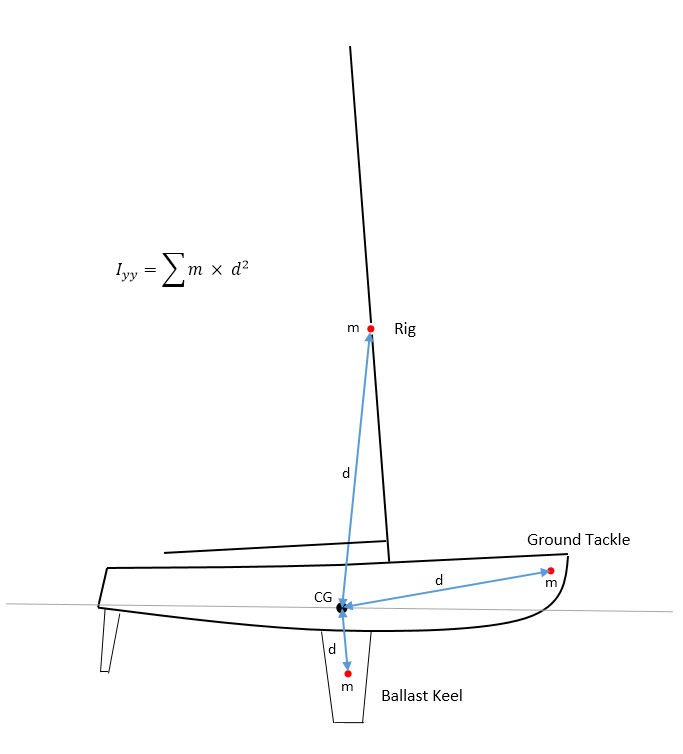 A large number of experiments were conducted at Delft TU with model yacht hulls (the Delft Systematic Series) and correlations between the longitudinal position of the centre of buoyancy (LCB, =LCG) as well as other parameters and hull resistance were extracted. The optimum position for the LCG depends on what speed you want to design for, but 53-54% LWL from the bow is the value most commonly used when designing cruising yachts. Because they used the length of the static waterline in their regression analysis and their hulls had overhangs, there are no reasons to deviate from their definition of LWL. Actual waterline length is what determines key characteristics of the wave system produced by the hull at a given speed, so if you are interested in wakes and speed potential, you should consider true wetted length. L/D ratios really are a measure of speed potential, which also means you need enough wind in order to exploit them. This little detail is often lost from sight or not understood. In light weather, L/D means very little. It becomes a matter of sail area/wetted surface. High values for L/D (or small values for the more traditional inverse D/L value) tend to penalise SA/WS, unless you can find a lot of stability and carry a big rig to offset it. This is very much what I ended up doing with Nordkyn, because I wasn’t prepared to sacrifice light weather performance. The centre of the waterplane is something else altogether. The hull tends to pitch around an axis running through the centre of the waterplane (LCF), because for a small change in trim, you gain and lose the same amount of buoyancy fore-and-aft of this axis. However, if you throw an object up in the air, it always revolves around its centre of mass (CG). A hull is the same. Ideally, it would pitch around its LCG, but it can only do so if the CG is also at the centre of the waterplane. Separating the two increases the amount of energy required to pitch the hull, because you now need to accelerate the centre of mass up and down in the process, instead of just rotating around it. This effectively increases pitching inertia and it tends to be beneficial, because you are better off cutting through short waves rather than trying to follow them. The ‘Patagonian Pundits’ seem to be fond of big anchors and some even use ‘slim’ HT chain whereas you seem to favour the reverse approach – but then how big is your other anchor? And you’ve got only two? Unsuprisingly you still use the now much maligned CQR but do you carry any other types as well? Are you familiar with Van Dorn’s work on elastic anchoring and do you or have you ever used a rope/chain combination in your primary rode? Do you carry long(>100m) shorelines? I have had CQR anchors for close to 30 years and used them all over the world. I have yet to find a reason to use something else. The difference may be that I use them at the end of a decent chain. I would consider using a Rocna for example, but not following the ridiculous chain recommendations that come with them (“buy a bigger anchor from us, so you can use a smaller chain” – the apex of stupidity). A Rocna will let go without any warning if you happen to be pulling upwards on it because the chain is too light, and then you go from anchored to wrecked on the shore in one smooth single move. I sailed Tierra del Fuego and the Patagonian Channels and completely disregarded all “advice” on the simple basis that the sloop Yarra was carrying the same chain as what the much larger steel charter yachts did: 80 metres of 10mm. I anchored almost every night for weeks, spent days storm-bound in anchorages and never considered taking a line ashore (what a joke for a single-hander arriving in a windy anchorage anyway) and I don’t care about what “people” say, because the bottom line is that you don’t argue with success. In Patagonia, I usually accepted to anchor in 60-80 feet of water. It was deep enough to avoid kelp beds and a look at the depth sounder was sufficient to show whether the bottom profile was smooth (sand, mud etc) or jagged (rock). I was able to get excellent holding. I made an exception to this if there was a river or waterfall, because it was then usually possible to find a good sandy bottom at a shallower depth and this meant less work the next morning before leaving. I saw the same clowns trying to anchor close inshore in the Antarctic Peninsula (where holding is abject), then taking lines ashore where there was essentially nothing to tie up to, and then dragging and getting pushed onto the beaches. Meanwhile, I was anchored alone in the middle and deepest part of the cove, where the bottom was thick heavy mud. Of course, I was wrong and they were right, but they were also the ones aground on the beach scrambling around in dinghies to try and get themselves off. What a laugh. I like to anchor in a decent depth, with 360 degrees swinging room and I don’t want the shore too close, so I have time to do something if I ever need to. Mixed rope/chain rodes and the like are all very well in concept, but chafe considerations simply rule them out for me. If you have enough depth and a sensible chain, the catenary effect provides plenty of elastic damping. I simply use all chain and hardly ever deviate. I can remember very few exceptions; one of them was once anchoring in 45 metres of water in the Aleutian Islands: that day I extended the chain with some nylon braid to get the reach and conditions were calm. All the anchoring arguments always originate from the same simple fact: people don’t want to carry the chain they should have, because they find it too heavy to handle, the windlass would be too big etc. Meanwhile, a long heavy anchor chain is better than all the insurance policies you can have. Nordkyn carries 80 metres of 13mm chain and considering that the rig is almost twice as tall as the mast of the Yarra, it would be completely foolish to even pretend anchoring on 10mm chain. Yet, 10mm chain is what some people were carrying on 48′ steel ketches with a displacement of 20 tonnes or more in Ushuaia. Then the extent of the drama they face make them Patagonia anchoring experts, with fancy-fangled advice about shore lines and tying to trees. Sure, whatever. Under what conditions would the deployment of an oiled or dry sea anchor be appropriate? Deploying a sea anchor by the bow is catastrophic. In true heavy weather it won’t prevent a boat from yawing widely and it is only a matter of time before it gets hammered on the beam, severely damaged and/or capsized. Even if you happen to take a hit square on, you can smash your rudder. A sea anchor deployed this way is also unretrievable and it will soon let go one way or another. The potential loads are almost unlimited. On the other hand, if you sail upwind, you benefit from dynamic course stability and it does an excellent job of holding the angle between the boat and the sea around a safe value, including in horrendous sea conditions. I sailed upwind under self-steering vane in seas where I would have been washed clean off the deck if I had tried to go outside. Downwind, if course stability is a concern, I find that sheeting a storm job in flat forward can do a remarkable job of assisting the helm without contributing to much propulsion and I will much rather do that than backing myself in a corner by deploying something off the stern that is almost impossible to retrieve afterwards again. Now, this stands for decent, capable sailing yachts. There are designs that can’t point while also being completely unsteerable downwind and, in this case, the best is still to leave them somewhere on a mooring. Some boats are death traps in true heavy weather and I would much rather be on something small, but capable, rather than much bigger and useless. The whole sea anchor saga originates back from the days when boats couldn’t be sailed either up or downwind past a point due to limitations that were inherent to design and/or the strength-to-weight ratio of the materials available for construction. A modern, capable yacht will literally sail in any weather. The sloop Yarra sailed upwind in conditions where it was impossible to stand on deck and gained ground. So I won’t have sea anchors on board and I won’t have anything to do with them. They are dangerous. I don’t believe there is anything like a passive solution where the skipper and crew can give up and it will all get taken care of by a “trick”. If I ever found a reason to tow something, like for stabilising a damaged boat downwind, then there would be enough chain and warp on board to rig something up. Weather-related accidents happen mostly when people stop sailing the boats, stop actively making decisions to manage the situation. What the “excuse” is doesn’t matter. There is no excuse. The further you go out there, the more capable you need to be to face what might happen. I always advise people to head out and sail their boats in storm force conditions in their home waters until they can handle the boat and the weather confidently. The first thing they discover is that a lot of things on board they thought were fine stop working when conditions get above a limit. Most cruising boats today are poorly set up. They are crippled by excessive windage and the sail handling gear is not up to functioning properly in storm force winds, because people succumb to the lure of “convenience”. The use of electric autopilots is suicidal. You never need your self-steering gear more than when it is dangerous to be outside and it must work perfectly and relentlessly for as long as required. It can be days. I can sail indefinitely in heavy weather as a single-hander, without getting exceedingly tired or worn-out, simply because the boat doesn’t need me to keep sailing. This means I can rest, cook and keep evaluating the conditions. I only go outside if something needs to be done. Thanks for the detailed and extensive reply. Due to my daughter having bought a Montegomery 15 foot, a supposedly off shore cruiser, a type, that unbelievably, someone has sailed to Hawaii from California, and I, personally having minimal experience at sailing. I decided to spend more than a few hours “Googling” up sailboat sinkings. The results show the following: capsizing and demasting, rudders destroyed or ripped off, keels torn off, hitting “something floating” in the sea or lake, whale strikes, barely submerged land formations, or coral reefs, collisions with other shipping, being blown ashore onto rocks or a beach… most of the previous usually the result of sailing in bad weather on seas or lakes often with surprisingly mild wave action… most of these incidents, unfortunately, cause a hole to form below the waterline. This apparently occurring whether the crew is experienced or not. If injuries, deaths and lost at sea incidents due to equipment failure, fires, fatigue, or rogue waves, and structural fatigue – disintegration are added to this mix, then the whole idea of ocean sailing fills me with the realization that despite someone becoming a skilled and knowledgeable sailor and spending the time and expense of acquiring or building a first rate sailing ship… You are risking your life everytime you leave for a voyage or cruise. The time you have spent sharing your knowledge and experience with all of us is appreciated. Serious incidents are not that common, and incidents that were not the result of incompetence, poor decision-making or plain mistakes in the first place are the rarest occurrence. You are much more in control of your destiny alone on a small yacht in mid-ocean than living ashore. The difference is more that there is no one to help you and you need to be self-reliant. In recent years, the frequency (and variety) of incidents certainly has increased, partly because there are more people on the water, but more importantly because capability and competency levels have dropped, sometimes down to ridiculous levels. We now have a broad category of cruisers who are so scared of encountering any weather on passage (the “weather window guys”) that they will routinely motor offshore for days or more just to try and get to the other side as fast as possible, before their window “expires”. Motoring offshore is stupid in the first place (you expend fuel and produce heat and noise where simply taking a little more time would get you there anyway), but it also comes with fairly significant failure and fire risks. Those risks materialise far from infrequently in terms of engine/transmission failure (then no engine any more when you reach the coast and might actually find a good use for it), occasionally it triggers the precursor of a fire (gear shifting with motion, unusually hot parts due to abnormally long running) and now and then a boat gets engulfed in flames for good (usually when fuel gets out) with no remedy. Those are not bad things that just happen (as some like to suggest it), it is the result of stupidity and incompetence. This is quite avoidable and it doesn’t make offshore sailing dangerous; it just makes stupidity and incompetence dangerous. Now, when it comes to boat sizes and the definition of “offshore”, anyone claiming that a 15-footer is an “offshore cruiser” in the blue water sense would need to be a moron. Sorry. If you elect to understand it as “a little off the coast in good weather”, then ok, I will take it back. If you try sailing even just the Trade Winds with 25 knots of breeze and a 3-metre sea, in what is little more than a decked dinghy, you might get rolled by a crest and capsize in what is nothing but beautiful sailing weather… to others. The smallest capable boats that truly sailed (not just survived) offshore in predominantly good weather regions seem to fall around the 20′ mark, such John Guzzwell’s Trekka (his book is a classic) and were of sound design and construction. For all latitudes, all weather cruising, the Yarra at 30′ and 4.5 tonnes loaded still proved to be adequate every time, but I honestly wouldn’t recommend going any smaller at all for such sailing. What you need to keep in mind is that the sailor is the one who has to bridge the gap between the boat in itself and a good outcome. With small boats, this gap gets wider. Small boat sailors tend to be much better seamen than those coming from bigger cruisers, because they have to. They don’t get away with slack practices. They tend to pull through heavy weather unscathed when others don’t, because they have their eyes open and do the right things early. Again, because they need to. Small boats give you an opportunity to learn early, but it might not always come for free. There is a natural selection process: many give up early, the odd one might go missing. The boat you are referring to is not only way too small for offshore work, but it is also completely inadequate by design. Half of its length is used by the cockpit, the companionway has a very low sill and the washboards are huge. Imagine a wave crest dumping in there. It should have the smallest possible cockpit and entranceway, as much buoyancy as possible and as much stability as possible, i.e. probably a fixed keel. If your daughter’s intent is indeed sailing offshore, then sailing this boat in fresh conditions in home waters could be a valuable learning exercise. Sailing one from Hawaii to California wouldn’t be impossible for a good sailor, but not particularly wise and some alterations may have been made, like fastening and sealing the lower washboard into place permanently. If circumstances forced me to do so, I would certainly sail a very small keeler across an ocean to get myself out of some situation, but it doesn’t mean that it is a good idea to do it. You are just a little too likely to have “adventures” doing that. There is also a big difference between completing one passage once and regularly sailing offshore: luck always runs out eventually. It is never a good idea to rely on it. Same for weather forecasts. The Yarra was a Dufour Arpege and this is a boat that can be had for fairly little money these days. They have long finished devaluating. Then you typically need to renew the rigging, tidy up the deck hardware and get some new sails and you have a very capable small ocean cruiser. With a bit of luck, you can find one where this has already been done. Brilliant article! !, I arrived whilst trawling the net for information regarding Lithium batteries and have been captivated by your writing on a range of topics since. Kudos to your travels and willingness to share your experiences. Thank you for your kind feedback. I am glad you found this interesting.